Who Should Participate in an IOP? 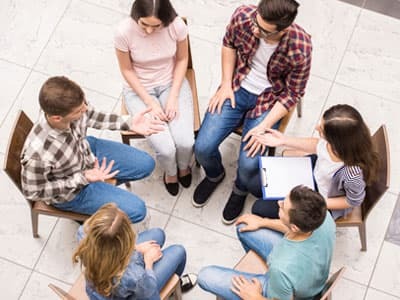 Intensive outpatient treatment (IOP) is a type of specialized outpatient addiction recovery program that provides more structure and a more intensive level of care than a standard outpatient program while still accommodating the person’s home and work life. It can be used as a follow-up to successful detox, as a primary form of care, or as part of an aftercare plan for someone who has completed an inpatient program. Definition of an intensive outpatient program. Who should participate in an IOP. Need Help Finding an Outpatient Program? Who Answers? . These trained representatives can confirm your insurance coverage over the phone. An intensive outpatient addiction program (IOP) provides people with the freedom to live at home and still attend work or school while receiving addiction services. While some people use an IOP as a primary type of care, others may transition to an IOP after completing an inpatient program to continue to build on coping skills and decrease the risk of relapse. Still others may require monitored detoxification and will transition to an IOP after going through detox. The biggest difference is that inpatient or residential rehab programs require that you live at the facility, while outpatient rehab programs allow you to return home when treatment sessions are finished. Inpatient programs can last 30, 60, or 90 days, and sometimes longer if necessary. These programs can be a significant commitment if you have other responsibilities. Conversely, people attending an IOP therapy program can schedule treatment when it works best for them. However, IOPs typically meet at least 3 days a week, for 2-4 hours each day. IOPs offer similar services to inpatient programs, such as individual, group, and family therapy, and are often just as effective. 1 Consequently, an IOP is a beneficial alternative to residential treatment when the person can’t afford to neglect home, school, or work obligations. Intensive outpatient programs for substance abuse offer many of the same services that inpatient programs do without you having to take time off of work or school and spend time away from family. Programs use a group counseling approach that helps to negate the high cost of individual therapy while building on important skills. If you’re thinking of participating in an intensive outpatient program, call our helpline at 1-888-319-2606 Who Answers? to find a program near you. You can use insurance or finance your treatment. Generally, an IOP costs less than an inpatient recovery program because it doesn’t provide food or housing. The cost will vary based on your insurance plan and how long you participate in the program. But it is likely that insurance will provide at least partial coverage. This is due to the Affordable Care Act, which recognizes addiction treatment as an essential health benefit.4 It requires that insurance providers cover alcohol and drug addiction treatment programs to the same extent that they cover other medical problems. This includes coverage through Medicaid and Medicare as well, as long as the treatment facility accepts your particular plan. Further, your insurance company can’t refuse coverage to you if you have a pre-existing condition, such as a substance abuse disorder. So if you don’t have insurance, you can shop for affordable coverage on the health insurance marketplace, which offers government-organized insurance plans. Financing your addiction treatment can seem daunting. But there are many different ways to help pay for rehab if you don’t have insurance or your insurance plan doesn’t provide full coverage. Crowdfunding: Certain websites, such as GoFundMe, IndieGoGo, and Crowdrise allow you to create campaigns in which you can raise money to pay for your addiction treatment. Payment plan/sliding scale: Many treatment centers understand financial hardships and allow you to create a customized payment plan based on what you can realistically afford. Health care credit card: Some companies cater to those with medical needs and have lower interest rates than standard credit card companies. Personal savings: You may want to consider using your personal savings as opposed to getting a loan or opening a credit card. Home equity loan: The interest rates for a home equity loan are typically lower than personal loans, so if you have a home to offer as collateral, this may be a low-risk option for you. Specialized loan: Some financial companies, such as My Treatment Lender and Prosper Healthcare Lending, offer affordable loan packages, which have lower interest rates than health care or standard credit cards. You don’t have to battle addiction alone. Call our helpline at 1-888-319-2606 Who Answers? to find an intensive outpatient program near you. A treatment support specialist is available to speak to you 24 hours a day, 7 days a week. Before you call, have your insurance information available as well as information about your drug use (length of use, frequency, amounts used), any medical or mental health problems that need treatment, and whether you are interested in an IOP therapy program in your area or would prefer to travel for treatment.
. Forman, R. F., and Nagy, P. D. (2006). Substance abuse: Clinical issues in intensive outpatient treatment. Rockville, MD: U.S. Dept. of Health and Human Services, Substance Abuse and Mental Health Services Administration, Center for Substance Abuse Treatment.
. The White House. Substance Abuse and the Affordable Care Act.
. American Addiction Centers. (2017).